Palestinian prisoners on hunger strike for justice: Support their strikes for freedom! Home Campaigns Hunger Strike Solidarity Palestinian prisoners on hunger strike for justice: Support their strikes for freedom! 50 Palestinian prisoners in Nafha prison have launched a collective hunger strike, protesting mistreatment, frequent transfers and poor conditions, returning their meals beginning Tuesday evening. The strikers are joining currently six Palestinian and Arab prisoners on individual hunger strikes in Israeli jails, protesting their detention. Mohammed Al-Qeeq (photo above), a 33-year-old journalist from Dura, has now been on hunger strike for over 40 days as medical experts warn of severe danger to his health. Held in administrative detention without charge or trial, Al-Qeeq launched a hunger strike on 25 November 2015. He is being held in Afula hospital and demanding his release; his lawyer reported that he is refusing medicines and at times water. 1. Mohammed Al-Qeeq: 33 y/o from Dura – occupied ‪#‎Hebron‬, on hunger strike since 25.11.2015 to protest his administrative detention. He was detained on 21.11.2015.11 and is being held in Afula Hospital. Al-Qeeq studied media at Birzeit Uni, and earned a Masters in Contemporary Arabic Studies, he works as a reporter for Al-Majd news channel. He was arrested three times before his recent arrest: in 2003, and in 2004 and sentenced to 13 months, and in 2008 sentenced to 16 months. He is married and has two children. 2. Shadi Mtawi’: 28 y/o from occupied Hebron, held in isolation cells in Megiddo Prison, and on day 23 of open hunger strike demanding an end to his isolation and to be transferred to prisons in the South. He has been held captive since 14.11.2015, and is accused by the occupation of carrying out a resistance operation and shooting a number of Zionists colonists and killing two of them. 3. Hassan Shokah: 27 y/o from occupied ‪#‎Bethlehem‬, held in isolation cells in Megiddo Prison, on day 23 of open hunger strike demanding an end to his isolation and to be transferred to prisons in the South. He has been held captive since 16.09.2015; and was transferred to administrative detention without charge. 4. Issa Abbasi: 30 y/o from occupied ‪#‎Jerusalem‬, on day 17 of open hunger strike in protest against preventing him from meeting his mother Alia Abbasi, who is also held captive in HaSharon Prison. He is married with two children. He was arrested by the Israeli occupation forces on 30.05.2010 and sentenced to 10 years imprisonment. 5. Abed Abdel Muti Abed: 52 y/o from Jabalya refugee camp – ‪#‎Gaza‬, on day 7 of open hunger strike in protest against the policy of deliberate medical negligence practiced by the Israeli Prison Service against him and against Palestinian political prisoners in general. He has been in isolation cells since three months, and has been held captive since 14.08.2002 and sentenced to 20 years. In addition to Jordanian political prisoner Abdullah Abu Jaber: on hunger strike since 08.11.2011 demanding to be transferred to Jordan to complete the remaining 5 years of his sentence. He suspended his hunger strike after 47 days after promises from the Israeli occupation intelligence to meet his demands, to resume the strike on 31.12.2015 when his demands were not met. He is sentenced to 20 years imprisonment and has been detained since 29.12.2000. Also, university student Mohammed Najdi is on day 11 of open hunger strike in Tulkarem intelligence prison. He was kidnapped by the PA security forces 59 days earlier. 1. Protest at the Israeli consulate or embassy in your area. Bring posters and flyers about administrative detention and Palestinian hunger strikers and hold a protest, or join a protest with this important information. 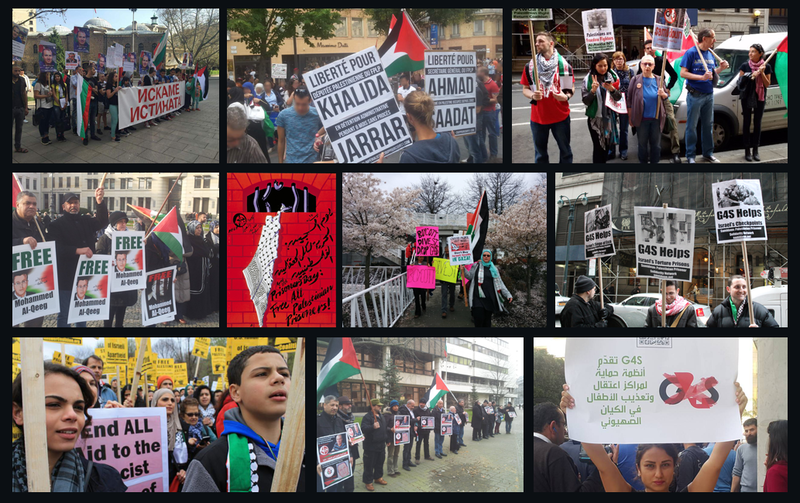 Hold a community event or discussion, or include this issue in your next event about Palestine and social justice. Please email us atsamidoun@samidoun.net to inform us of your action – we will publicize and share news with the prisoners. 2. Contact political officials in your country – members of Parliament or Congress, or the Ministry/Department of Foreign Affairs or State – and demand that they cut aid and relations with Israel on the basis of its apartheid practices, its practice of colonialism, and its numerous violations of Palestinian rights including the systematic practice of administrative detention. Demand they pressure Israel to free the hunger strikers and end administrative detention. 2. Boycott, Divest and Sanction. Hold Israel accountable for its violations of international law. Don’t buy Israeli goods, and campaign to end investments in corporations that profit from the occupation. G4S, a global security corporation, is heavily involved in providing services to Israeli prisons that jail Palestinian political prisoners – there is a global call to boycott it. Palestinian political prisoners have issued a specific call urging action on G4S. Learn more about BDS at bdsmovement.net. 8-15 January, Global Week of Action: Justice for Omar Nayef Zayed!